Sen. Orrin Hatch briefly ran against Former Pres. George W. Bush in 2000. Sen. Orrin Hatch will retire next month, winding down a political career spanning four decades ... longer than any elected official in Utah's history. The 84-year-old will likely be remembered for his role in bruising Supreme Court nomination battles, passing the Children's Health Insurance Program and funneling millions of dollars back to Utah. But this week, KUER is remembering lesser known parts of Hatch's legacy. Today, we start with Hatch's 2000 presidential run. There comes a time in every senator's life when he or she takes a long, hard look in the mirror and sees, in their reflection, quality presidential material. For Sen. Orrin Hatch, that time was the year 1999. “He felt like he was in a stage of his career where, if he was president of the United States, he could really get a lot done for the country,” said Jason Perry, director of the University of Utah’s Hinckley Institute of Politics. At that time, Hatch had already been in the Senate for more than 20 years and passed some major bills, like the first version of the Children’s Health Insurance Program (CHIP) and the Religious Freedom Restoration Act. The Utah Republican didn’t keep it a secret that he’d been toying with the idea of running for president. A June 1999 article from the Salt Lake Tribune reported Hatch said at the state Republican convention that he was considering a presidential bid. In early 1999, the Utah Legislature seemed to encourage him by changing state election law that allowed him run for president and seek re-election to the Senate at the same time. Hatch declared his candidacy in July of that year, but struggled to garner attention and raise money. He made no secret of that either. “With my low-budget campaign, I’m not going to put any negative ads out,” he said to laughter during a Republican debate in January 2000. “If I can get enough people to send in $36 each, a million people, I’ll have enough money as George W. Bush has, and that’s all I’d need to win the presidency,” he said at a campaign stop in Iowa. 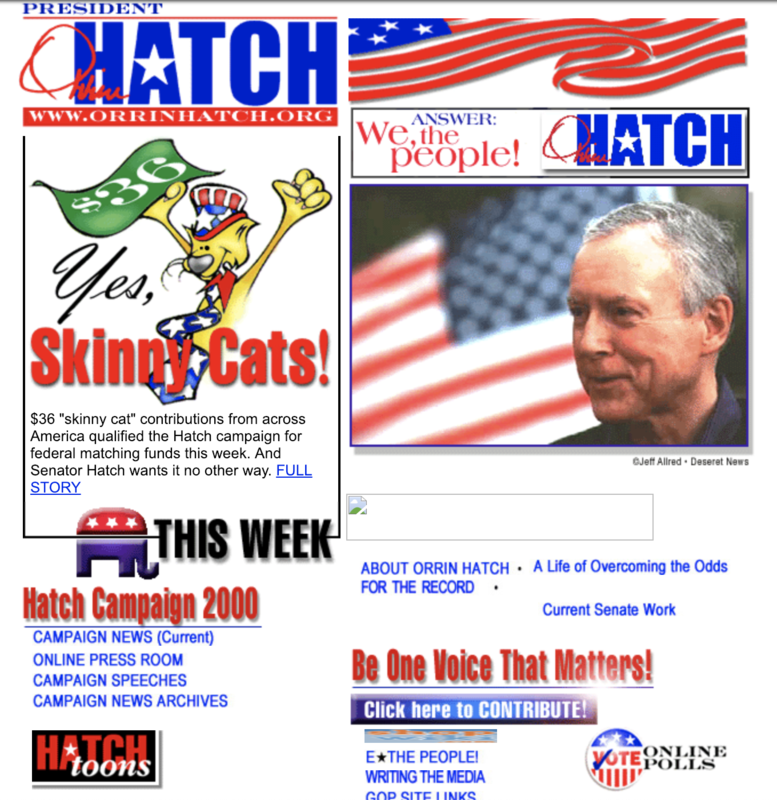 Sen. Orrin Hatch's campaign website from the 2000 Republican Presidential primaries. In the end, Hatch only raised about $2 million, but the Utah Republican was one of the first presidential candidates to make the internet a campaign issue. He said his campaign website was more user-friendly that George W. Bush’s, but he also warned against early web regulations. “I’m worried about the almighty hand of the federal government coming in and oppressing the internet and stifling innovation and creativity,” he said during a presidential debate. But Hatch failed to set himself apart from the rest of a crowded field of GOP candidates. He largely campaigned on his already-formidable legislative record, a message that didn’t stick with voters. “How many of [the other Republican presidential candidates] have the experience, the knowledge, the ability to work with this really tough, separated power called Congress, and to really fulfill all these promises that they are making?” he asked the crowd at a candidate forum in Iowa days before that state’s presidential caucuses in January 2000. “Well, that’s a question you’ve got to ask yourselves as we find out in Iowa who’s going to come out of Iowa,” he said. But Orrin Hatch did not come out of Iowa. He got just 1 percent of the vote in the caucuses and dropped out of the race a few days later. He endorsed George W. Bush, came back to Utah and focused on winning back his Senate seat, which he easily held onto. Hatch was far from clinching the Republican Presidential nomination in 2000. But the Hinckley Institute’s Jason Perry thinks the short-lived campaign led to a pivotal realization for the senator. “I think he discovered that there’s even more power in making the laws long-term than there is in the short-term enforcing of those laws,” Perry says. And after 42 years of legislative battles and a hand in seating today’s entire Supreme Court bench, Hatch is finally leaving the one place he knew he was most effective. As he prepares to leave the U.S. Senate after 42 years in office, Orrin Hatch said Congress’ upper chamber “is in crisis” and called for more unity in politics.